We hope you had a great time at our festival which judging from the feedback received so far was well received and enjoyed by over 4000 people. Thank you and see you 1st to 4th May next year. Thank you to the many members who attended our 27th Festival at the Apex during April. This years event was the most profitable on record, helped in a large part by the generosity of our sponsors and advertisers, and of course by the record attendance of over 4000 people who enjoyed the beer, cider and atmosphere. This year’s event was supported by volunteers from three local charities, Gatehouse, Hearing Dogs for Deaf People and Upbeat Heart Support Group, working alongside CAMRA members to deliver the festival. In addition the Milkmaid Folk Arts Centre arranged for festival music with time generously donated by a variety of local musicians. The charities will be presented with donations from this years festival at an event taking place at Oakes Barn, St Andrews Street South, Bury St Edmunds this coming Sunday, 19th August, at 2 p.m. Please come along and join the celebrations. 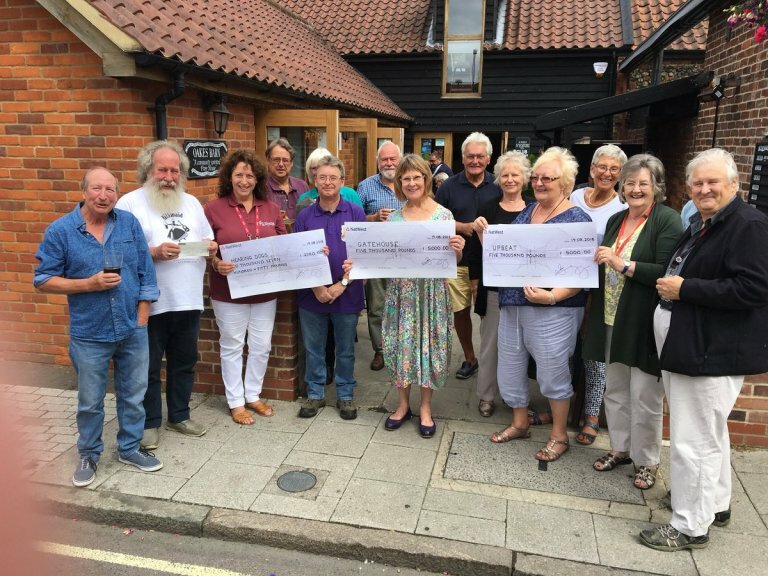 Our 2018 EAST ANGLIAN BEER & CIDER FESTIVAL raised a staggering amount of money for LOCAL good causes. Presentation of cheques to our three nominated charities took place on 18th August at Oakes Barn in Bury St Edmunds, see picture on left. The Apex Bury St Edmunds between 1-4 May 2019. Can you help organise the 2019 beer festival? 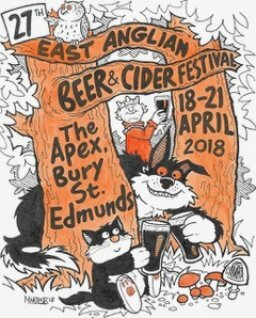 The Branch is already starting preparations for the 2019 East Anglian Beer and Cider Festival which will be held at the Apex in Bury St Edmunds 1st-4th May 2019. A successful festival relies on good organisation with volunteers committing some of their time to help to prepare and run the event. If you would like to help with the festival please contact the organisers at the address below. The event also offers sponsorship and advertising opportunities for local businesses. Please contact ku.gro.armac.kloffustsew@lavitsef for more information.